This pretty cupcake is a fun design to crochet. It's worked using tapestry crochet, and the finishing touches are added to cross stitch and surface crochet. If you'd like to work this pattern but you don't think of yourself as an experienced crocheter, please don't let the skill level rating scare you away. On the one hand, this pattern isn't complex; it's worked mostly in single crochet, and no complicated shaping is required. However, you do need to know how to do color changes, and you will also be carrying two inactive colors of yarn throughout. If you haven't practiced the tapestry crochet technique yet, you'll find that maintaining a consistent tension throughout the piece can be a bit of a challenge. If you haven't yet tried tapestry crochet, we'd recommend working a simple checkerboard pattern first―it's much easier than this cupcake pattern. That practice piece will give you a good feel for the technique. If you can successfully finish the checkerboard, you'll likely achieve success with this cupcake too. Color D: red (cherry color)―This can be scrap yarn. You only need a small amount of it. This project sample was crocheted using worsted weight yarn. The two pink colors are Cascade 220 wool, the tan is a mill-spun New Zealand wool yarn, and the red yarn is Paton's classic wool. It could be interesting to try crocheting this pattern in other yarn weights and other fibers; feel free to experiment if you like. Crochet Hook: You'll need a hook that's compatible with your chosen yarn or fiber. Tapestry Needle: A tapestry needle is essential for working the cross stitch part of this pattern; it is also handy for weaving in your loose ends when you are finished crocheting. Finished Size: This sample piece measures approximately 8.5 inches square. To crochet the square, you'll be working with three of the four yarn colors. Although the first four rows are worked in color A alone, carrying colors B and C from the beginning and then continuing to carry both your unused colors throughout the pattern is recommended. This helps with two things: first, it helps you to achieve stitches that are more square than they would be otherwise; the carried yarns add to the height of your stitches. Second, it makes it easier to maintain consistent tension throughout. Using color A, ch 29, begin working this cupcake color chart, Do not crochet the red Xes on the chart; ignore them for now. The Xes denote areas that will be cross-stitched, and the cross stitch will be worked over top of the cupcake pattern after you are finished crocheting the square. When you have finished crocheting the chart, work a round of sc st around the outer perimeter of the square using color A. We worked 2 ch sts to form each corner. For a bit of extra dimension, you can work around of surface crochet slip stitches in the spot where the border touches the outer edge of the charted design. If you look closely at the photo, you can see this little detail on the sample project. This is optional, and the design would be okay without it. Thread your tapestry crochet needle using color D. Use it to cross stitch the cherry onto the top of the cupcake. Each red X on the chart represents a cross stitch on the finished piece. Insert your hook into a spot where colors A, C, and D touch each other. Pull up a loop of color C and use it for working an outline of surface crochet slip stitches around the outer edge of the frosting on the cupcake. You'll be working these sts in the area where colors A and C touch each other. This is your opportunity to "clean up" the jagged edges and make the cupcake look as appealing as possible. Study the sample carefully; see how the surface crochet stitches are used to outline the piece. Using color D, work a round of surface crochet slip stitches in a circle over top of the cross stitched area. This makes the cherry motif appear to be round instead of square. End off color D and weave in loose ends. Insert your hook into a spot where colors A, B, and C touch each other. Pull up a loop of color B and work surface crochet slip stitches around the edge of the cupcake, working around the area where colors A and B touch each other. End off. Weave in the remaining loose ends. Block the piece if desired. If you crochet a bunch of these squares using lots of different colors and kid-friendly yarns, you could join the squares together to make an adorable child's afghan. Combine multiple squares to make placemats or table runners. Crochet two of these, stitch them together with wrong sides facing and use the piece as a hot pad or large potholder. Assuming you used a felt table yarn to crochet it, toss the piece in the washer and dryer to felt it; depending on how it turns out, you can probably use it all by itself as a hot pad or potholder. There are zillions of other ways you could use this design, and we invite you to use your creativity and adapt it as you see fit. We hope you'll have so much fun with it, and that your finished project will give you and your loved ones much enjoyment. 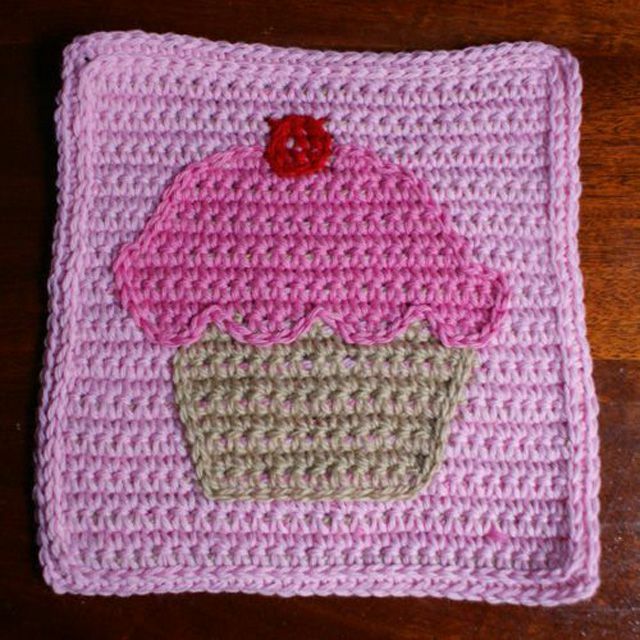 This crochet color chart features a cupcake motif with a cherry on top. This version of the chart is intended especially for left-handed crochet enthusiasts to work with; it's exactly the same as the right-handed version of the chart, except that the entire image has been flipped horizontally. This allows left-handed crocheters to end up with the same image that right-handed crocheters do.